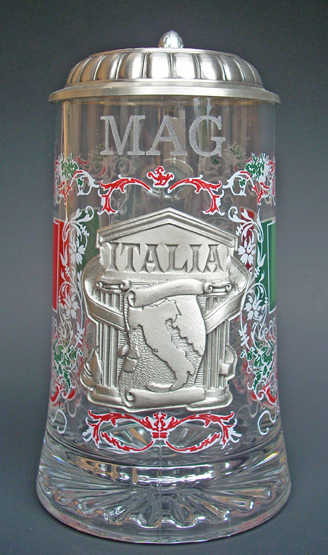 Custom laser engraving lets you turn an ordinary beer glass into a statement. 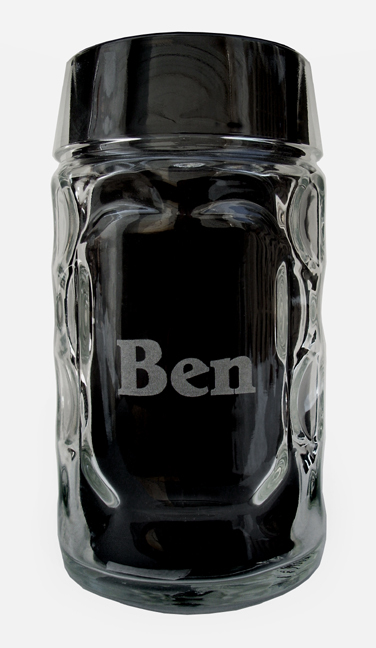 Whether it's your name, a corporate logo or special event keepsake like a groomsmen gift, we can personalize your stein, mug or boot with the message you want. Select a glass type to see examples of work we've done! 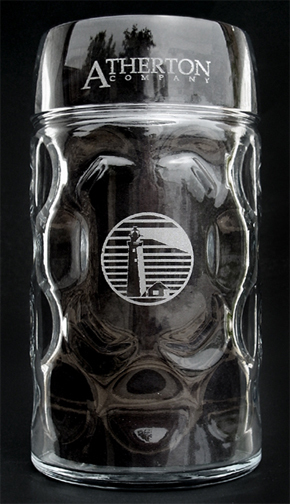 Choose an engravable beer mug, stein, or glass (check out all of our engravable glassware). Find the "Custom Engraving" checkbox and click it to reveal font options & lines of text to fill in. Choose your favorite font. Here are some examples you can use to preview. Enter the text you want to see on the glass! You can enter up to 4 lines. "Per Item" applies to laser engraving on one side or one position of the product. Multiple lines of text will be centered, unless otherwise instructed. Add $4.95 to the per item price for each additional engraved side or engraving above the fill line. Please allow up to 4 business days (excludes weekends & holidays and bulk orders) for laser engraving orders to ship. All laser text engraving is done in-house by our trained staff. 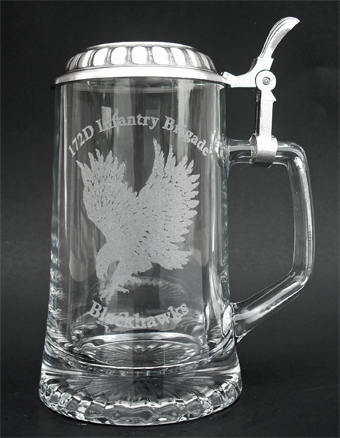 Call 1-844-BEER-MUG (233-7684) to place an order for engraving an image. * "per item" applies to laser engraving on one side of the product up to a 6 sq. inch area. 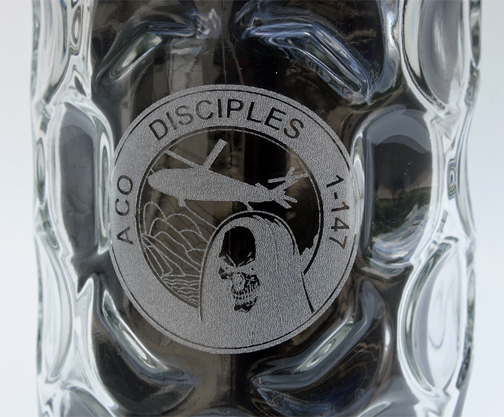 For each additional engraved side or engraving above the fill line on the 0.5 & 1 Liter Dimpled Glass Mug or Beer Boot add $4.95. **Suitable files for engraving: black & white line drawing image (no halftones/gradients) in a vector format file (preferred) or an image with a minimum of 300 dpi (dots per inch). When submitting your artwork for an engraving order, you are agreeing to the fact that you are in ownership of or have permission to use the logo/decoration supplied. All laser image engraving is done in-house by our trained staff. 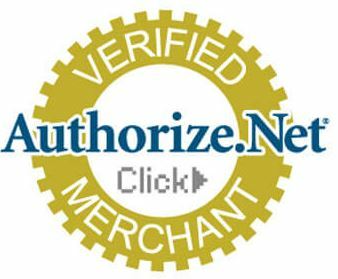 Please allow approximately 4 business days (after art approval, if applicable, excludes weekends & holidays) for image engraving orders to ship. No matter what the occasion may be, nothing radiates vibrant rays of pure, unfiltered, awesomeness and sophistication like a personally engraved beer mug, perfect for celebrations, gifts, or just plain fun! 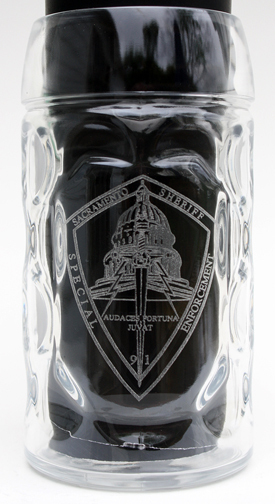 We here at Germansteins.com understand the need for personalization, which is why were are proud to offer engraving services on a large selection of our available beer mugs, glasses, steins, and even these legendary German beer boot glasses. After all, there is only one thing that can make your oversized 2 liter boot mug more of an awe inspiring piece of art that would make Picasso himself jealous. That obviously would be your name, company logo, or whatever else your beer-drinking heart desires clearly engraved, by our team of specialists, right on the front for everyone to see. Check out our most popular seller on Father's Day! Looking for something to get your hard-to-shop-for dad when Father’s Day season rolls around? Does your dad enjoy drinking beer? Well of course he does! Give your old man an even more enjoyable beer drinking experience with a custom engraved German beer stein or personalized beer boot. Custom engraving is a great way to personalize any gift, and will provide your father with a new trophy piece to add to his collection. This is a great way to show Dad that you care without the need to take out a second mortgage! In fact, because they are so economically priced, you can even afford to make a custom glass or mug an annual tradition! So, give your beer drinking dad a gift he can put to good use, and browse through our vast inventory of custom engraved glassware. Shop personalized beer mugs for dad. 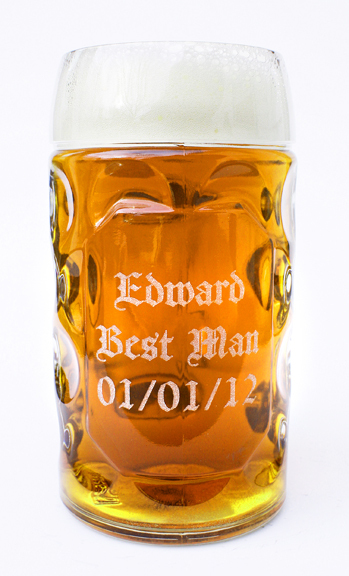 Custom engrave courting lederhosen and dirndl beer glasses to etch your love in glass! Whether it be your boyfriend, husband or whoever that special man is in your life, our personalized beer mugs and German accessories make great gifts that men love. Personalized gifts are naturally viewed as better than right off the shelf, mass produced items that thousands of other people own. It is the goal of our engraving services to really help you show someone that you were thinking about them. In addition, our glassware is available in all sorts of different styles, shapes, and sizes making them the perfect conversation piece for discussion amongst any man’s overly juvenile buddies, as they sit in front of the television like cavemen around a campfire. Shop personalized beer mugs for your boyfriend or husband. This is the perfect gift for the two of you. You've never sipped beer with so much love and admiration for your significant other. 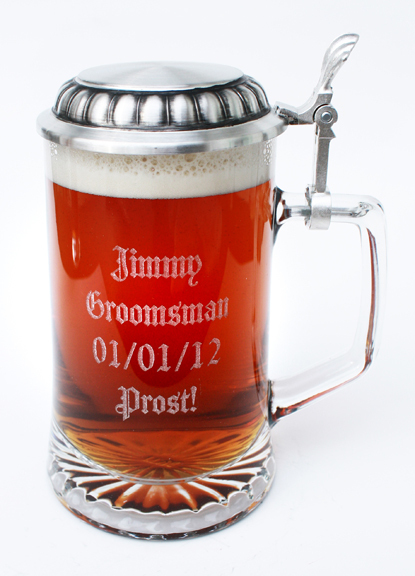 Custom engraved beer steins are ideal for birthdays, Christmas, or even just spontaneously to show him that you care. The sincerity behind a personally engraved mug is genuinely heartwarming, and our products are perfect for men who are often extremely difficult to shop for. Floor your wedding party with a batch of custom engraved beer glasses! Nothing serves as a better memento for your buddies to remember your eternal unification in holy matrimony than a custom engraved glass beer mug for your wedding party. After all, they still have a lot of single years left ahead that they are able to get some solid use out of a quality beer stein while loading the dishwasher, picking out throw pillows, or looking for Chinese cabbage (it’s called bok choy by the way) at the local farmer’s market. We currently offer a wide selection of engraving options, and by utilizing the latest technology in laser engraving, we are able to create exceptionally detailed logos, fancy scripts, or keep things simple with just your wedding date. 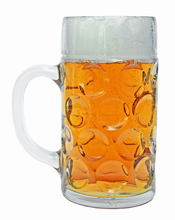 Ladies, our German steins make excellent gifts for you and your wedding party as well. Unlike advertisements of the 1950s that portrayed beer solely as a working man’s drink, beer consumption and culture is now becoming incredibly popular among American woman. Shop personalized beer mugs for wedding parties. We are constantly receiving orders centered around the bridal party, as the magical goodness of quality beer should be enjoyed by everyone who is of legal drinking age. Plus it is highly unlikely that any bride is going to like the idea of sitting at the reception table drinking a delectable German lager out of the finest available red solo cup. Check out some of our engraveable items that are guaranteed to bring a sense of class and sophistication to your wedding party. In the United States, a young person’s 21st birthday is often viewed as a rite of passage. Some choose to drink until every room magically transforms into a bathroom, while others have a classy craft beer or two with their families. 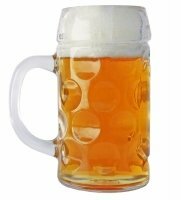 With glass beer mugs, steins, and other drinking devices ranging from .5 to 2 liters in size, Germansteins.com has got you covered, no matter what your birthday plans might be! These glasses are perfect for a young person to hand out to their best friends to utilize on their special night, or buy as a present for your newly legal son or daughter. Shop personalized beer mugs for a 21st birthday. All of our products come with our quality guarantee, and make fantastic trophy pieces for years to come! However, if you plan on going out, we strongly recommend you leave the glass at home as simple safety precaution. For a small upcharge, many of our available types of glass products can even be custom engraved to commemorate the day you were able to consume what clearly has to consume your first beer…or 24. Just be sure to have a designated driver in mind! Show your appreciation for your mentor’s years of dedication helping you hone your skills. Get them a gift they won’t forget. Personalize a beer mug or glass with an etching of their name, your team’s logo or the day your conquered your league and won a championship. Soccer, baseball, basketball and football coaches sacrifice hours and hours of their free time and exercise seemingly impossible patience to help you grow into a disciplined athlete – and a confident, productive individual. Let them know it. Gift them a personalized mug for their collection and they’ll never forget the impact they’ve had on your life. Check out our inventory of sports themed beer steins.